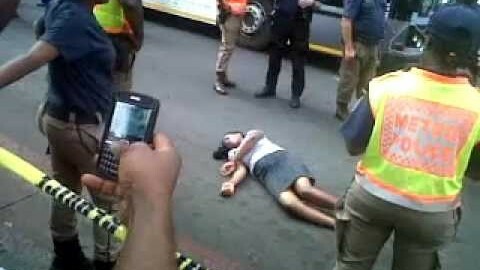 JOHANNESBURG, SOUTH AFRICA (INDEPENDENT) -- The spate at which Nigerians are becoming easy targets of reckless abuses and killings being perpetrated by the South African nationals as well as security operatives in the wake of worsening xenophobic culture is indeed disturbing and intolerable. Since the widely reported 2015 xenophobic attacks on foreign citizens in South Africa, consistent pattern of premeditated killings of Nigerians have featured regularly; if not on weekly basis. Perhaps more shocking is that a handful of these killings have been carried out by South African Police in manners that suggest connivance of security authorities in selective xenophobic attacks targeted against Nigerian nationals living in the country. In the most recent attacks, a 25 year old Nigerian, Ibrahim Badmus was extra-judicially murdered in a police raid in Vaal near. Badmus’ death occurred barely a week after the killing of a 35 year old Jelili Omoyele following his apprehension by the police. Prior to these killings, a 27 year old Nigerian citizen, Kingsley Ikeri was also allegedly tortured to death by the police at Vryheid town in Kwazulu Natal Province of South Africa. One week earlier, Clement Kalu, a 35 year old Nigerian was murdered at Springs Town near Johannesburg. Scores of Nigerian citizens living in South Africa have been victims of questionable and avoidable attacks perpetrated under circumstances that are shrouded in controversies but undoubtedly extra-judicial and cruel. The Committee for the Defence of Human Rights (CDHR), in a statement in June, 2017, described the killings of Nigerians in South Africa as barbaric and demanded official apologies and as well as compensation from the South African government. According to CDHR; “no fewer than 116 Nigerians are believed to have been killed in South Africa unjustly and with impunity within the last two years out of which 70% of the killings were perpetrated by men of the South African Police”. It is particularly disgusting that the incidences of extra-judicial killings of Nigerians in South Africa have been characterised by torture as well as various forms of inhumane and degrading treatment. But more disheartening is that these unfortunate and avoidable killings have continued unabated without the South African government taking decisive steps to check the ugly trend. It is instructive that the South African government has not only failed to guarantee the protection of lives and property of Nigerians living in South Africa but equally not showed remonstration in ensuring that justice is done in the light of wilful criminality of her citizens. It is condemnable that the South African government, in spite of the series of killings, is yet to demonstrate commitment to apprehending and prosecuting perpetrators of these heinous crimes to serve as deterrent for xenophobic activities. The international community owes it a duty to hold the South African government to account for failing to guarantee the safety of foreign nationals who are daily being subject to reckless abuses, maiming and killings. It is rather frustrating that even in situations where atrocities were carried out by South African nationals, the complicity of South African Police through denials of fair hearing as well as in covering up the misdeeds of perpetrators has become habitual. Considering the worsening state of insecurity Nigerians are exposed to in South Africa, we are compelled to call on Nigerians already in South Africa and those aspiring to travel to the country to be more cautious and weigh all options; including alternative decisions to avoid untimely and needless deaths. We however share the frustrations of Nigerian citizens at home and in the Diaspora as expressed by the CDHR that “routine, verbal and pedestrian reactions” by Nigerian government officials to the situation in South Africa could no longer be enough to dissuade the South African government from condoning the ugly tide of reckless killings of Nigerians. Perhaps it’s about time Nigeria deployed more decisive diplomatic stance in engaging the South Africa government.